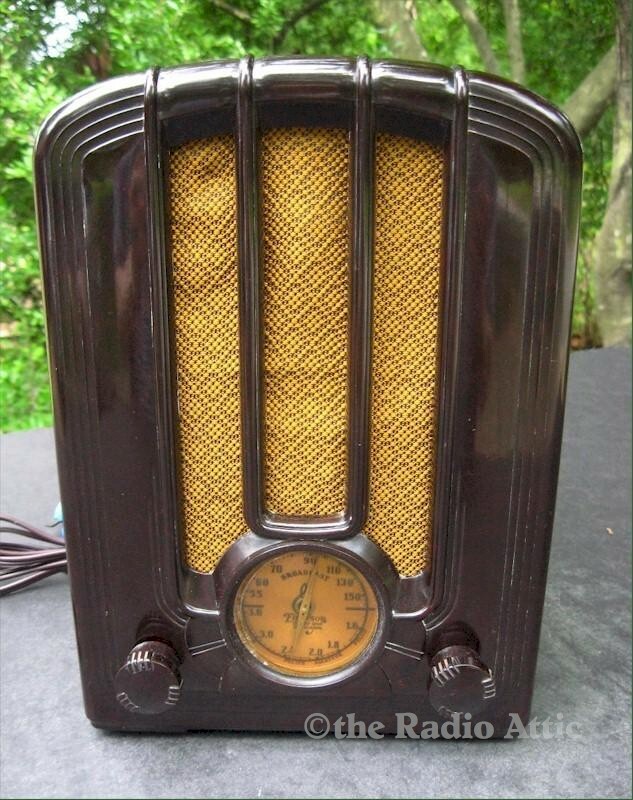 To see more of this seller's radios, visit David Spivey's Radio Attic. This 1936 mini Bakelite tombstone radio is one of the most collectible of all Emerson radios. The chassis has been checked by a professional, completely recapped, and its resistance line cord (curtain burner) replaced with a new cloth cord. The radio plays very well using its original antenna wire. The dial light is working as well. This is a two-band radio, but the SW band is the old amateur/aviation band. The band switch is in the rear. The case is in remarkable condition, no cracks, chips or hairline cracks, even has a nice shine. The radio has its original complete Bakelite back on the set. A really nice example of this model, and a must for any collection. About 9-1/2"H x 7"W x 5"D.
You are visitor number 2,514 to this page.